Wind is an abundant and secure energy resource and could one day supply up to 30 percent of electrical power in the United States. With today’s computational models scientists have been able to make great improvements to individual turbine efficiency. However, to advance wind energy and harness its full potential, researchers need to understand the performance of a wind plant as a whole; and, for that, they need exascale computers. The terrains surrounding wind plants (whether coastal, mountainous, or flat) and the interactions between the dozens to hundreds of turbines located at a plant produce complicated flow physics and wake formations that impact overall plant performance. 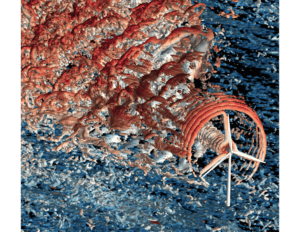 Exascale-enabled simulations of wind plants can provide more accurate predictions of performance under a range of conditions and lead to new turbine design models, wind plant locations, and operational controls. 07/03/17 Wind is an abundant and secure energy resource and could one day supply up to 30 percent of electrical power in the United States. Scientists have made great improvements in wind turbine efficiency, but to advance wind energy and harness its full potential, they need exascale computing. 10/11/16 The National Renewable Energy Laboratory (NREL) will work on wind plant modeling and three other projects for the ECP.